Bursting out of S.T.A.R. Labs, a Tess Mercer-controlled robot lunges to attack LexCorp's hired guns. At LexCorp R&D, Lex and Otis are immediately attacked by Tess. Grabbing Lex, Tess is about to kill her half-brother, but decides against it. Later in Watchtower, Emil confronts Tess about her almost-murder of Lex Luthor. Tess tells Emil that she wants to make the better of her second chance at life and decides to get back to helping Clark track down some harpies. At LexCorp, Otis arrives to greet Lex, but Lex has other things on his mind. Recounting the Earth-2 Lionel Luthor, Lex decides that the ship that crash landed in Smallville when the Guardian platform malfunctioned has to have been from another Earth. 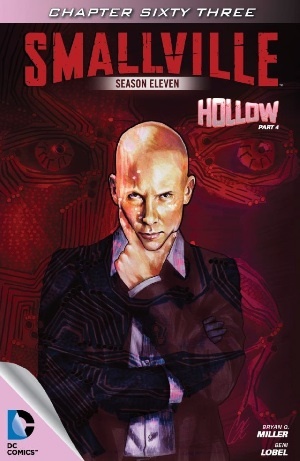 Story - 2: I'm not gonna lie, "Hollow" is probably tied with "Valkyrie" as my least favorite Smallville: Season 11 story. Ultimately I was glad that CorTessa didn't kill Lex, but there seemed to be something missing in this chapter, and this arc in general, as it was very "lack-luster". I think CorTessa hit the nail on the head, she's "Tess two point oh". To me, Tess Mercer died the way she should have (again, this is coming from a fan of the character), which is helping keep Clark's secret, in "Finale". That's it, Tess Mercer is dead. CorTessa is just a projection of who Tess once was, and a decent one at that. I don't want it to come across like I hate the writing of the book (because it's excellent), because the writing of this story was actually pretty good. It's the story in general that I'm not fond of. It seems to me like the Season 11 Specials are focusing more on characters who do NOT need to be focused on as they are a part of the main cast anyway. "Effigy" did it right with Martian Manhunter (a guest character from the show) teaming up with a new Season 11 character (Batman) and fighting a threat that was happening somewhere else other than Metropolis (although it partially happened in Metropolis too...). "Valkyrie," to me, was good of course, but wasn't a necessary story to tell. They could have easily explained Lana in some other fashion or even given her, her own story (aka without Lois, who is already a main). "Hollow" feels the same way. CorTessa and Lex are already main characters, so why do we need to read a story all about them? The answer, in my honest opinion, is that we don't. Again, I don't mean to be too harsh as it was still a well written story, but at the same time, I do not really care about the CorTessa character, at least the way she is now. Emil and Lex, yes I care much about them, but this alternate Tess is starting to get old, and fast. Overall, props to Bryan Q. Miller for good writing and character development (something he's always been very good at), but I still hold to my point that this story was unneeded and ultimately pointless. The story was very "hollow" indeed. Art - 5: Love the art as always. No problems here whatsoever.